I just read from yahoo today that a 12 year old girl committed suicide after months of being cyber-bullied. Her death is the latest in an apparently growing phenomenon of youths driven to taking their own lives after suffering cruel treatment online via text and photo messaging applications. – Yahoo Philippines. At one point as a mother, it is really inevitable to monitor our kids constantly. As for me, Adi is still a toddler and by the time he grows up, I couldn’t imagine having to deal with this kinds of treatment. The psychological and emotional outcomes of cyber bullying are similar to those of real-life bullying. The difference is, real-life bullying often ends when school ends. For cyber bullying, there is no escape. And, it’s getting worse. Read on to get the facts. 1. Nearly 43% of kids have been bullied online. 1 in 4 has had it happen more than once. 2. 70% of students report seeing frequent bullying online. 3. Over 80% of teens use a cell phone regularly, making it the most common medium for cyber bullying. 4. 68% of teens agree that cyber bullying is a serious problem. 5. 81% of young people think bullying online is easier to get away with than bullying in person. 6. 90% of teens who have seen social-media bullying say they have ignored it. 84% have seen others tell cyber bullies to stop. 7. Only 1 in 10 victims will inform a parent or trusted adult of their abuse. 8. Girls are about twice as likely as boys to be victims and perpetrators of cyber bullying. 9. About 58% of kids admit someone has said mean or hurtful things to them online. More than 4 out 10 say it has happened more than once. 10. About 75% have visited a website bashing another student. 11. Bullying victims are 2 to 9 times more likely to consider committing suicide. 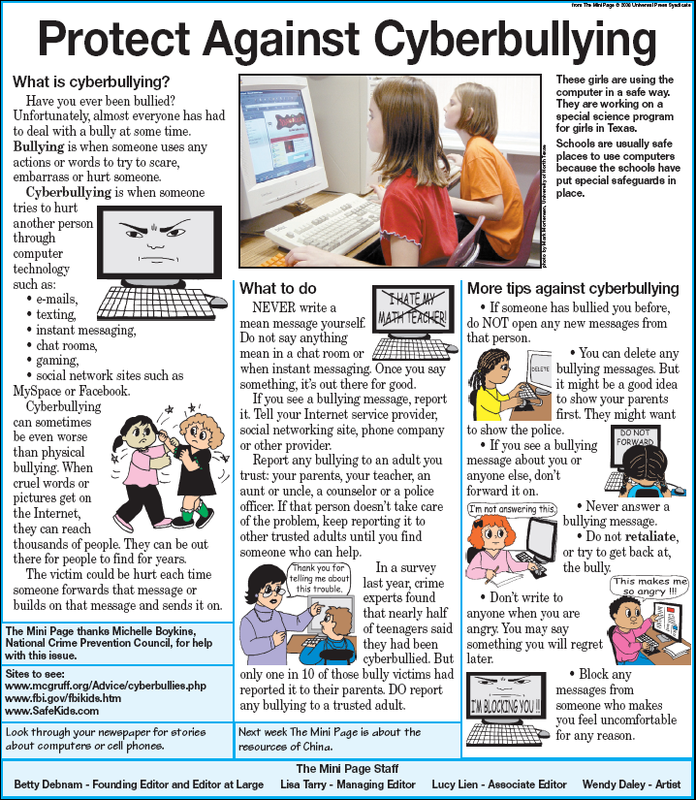 What can you do to help stop cyber bullyiing?